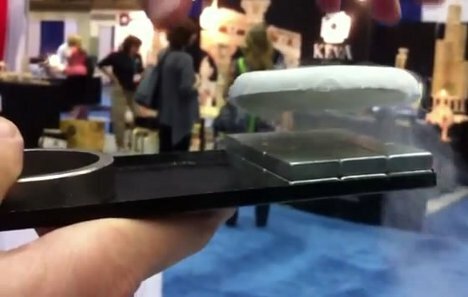 If you ever needed proof that science is completely amazing, the mind-blowing phenomenon of quantum levitation might just do it. A group of researchers from Tel-Aviv University demonstrates the incredible effect in the video below. We aren’t physicists, but the science behind the phenomenon goes something like this: a crystal sapphire wafer is coated with an extremely thin ceramic layer. When it is cooled to an extremely cold temperature, the ceramic-coated wafer becomes a superconductor. Putting the superconductor into a magnetic field causes something called the Meissner effect. From there, there is a lot of complicated physics that happens with magnetic fields, superconductivity and magnetic flux tubes. 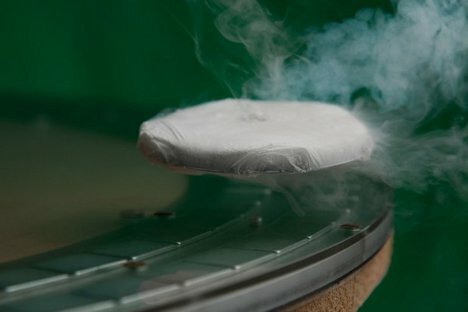 The powers of superconductivity and magnetism fight against each other. When the superconductor moves, the flux tubes move as well – but the superconductor tries to prevent this and so becomes “pinned” or “trapped” in mid-air. The effect is nothing short of stunning. The wafer appears to levitate effortlessly – and it doesn’t hurt that it gives off impressive amounts of vapor, making the demonstration look almost like magic. It even seems to float upside-down. We have a feeling that if every high-school science teacher used a demonstration like this in class, we wouldn’t be saying “we aren’t physicists” today.